MAXXI National Museum of 21st Century Arts, Rome, 2009. 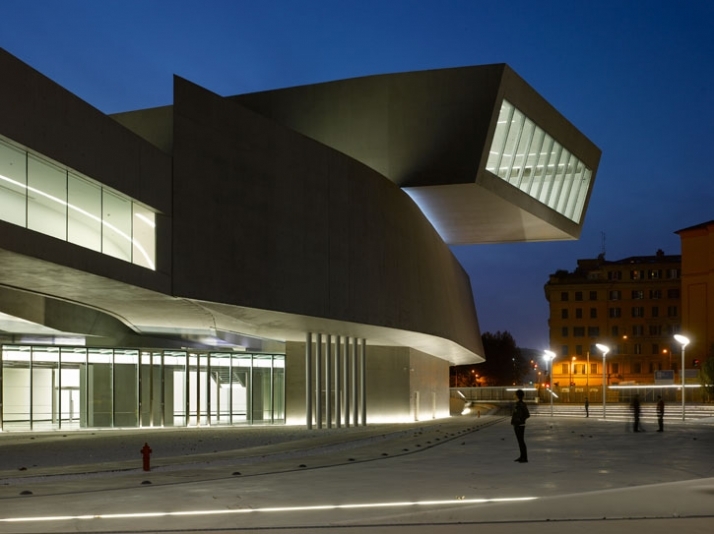 Designed by Zaha Hadid Architects, the MAXXI National Museum of XXI Century Arts, instituted by the Italian Ministry for Cultural Heritage and Activities is Italy’s first national public museum dedicated to contemporary creativity. 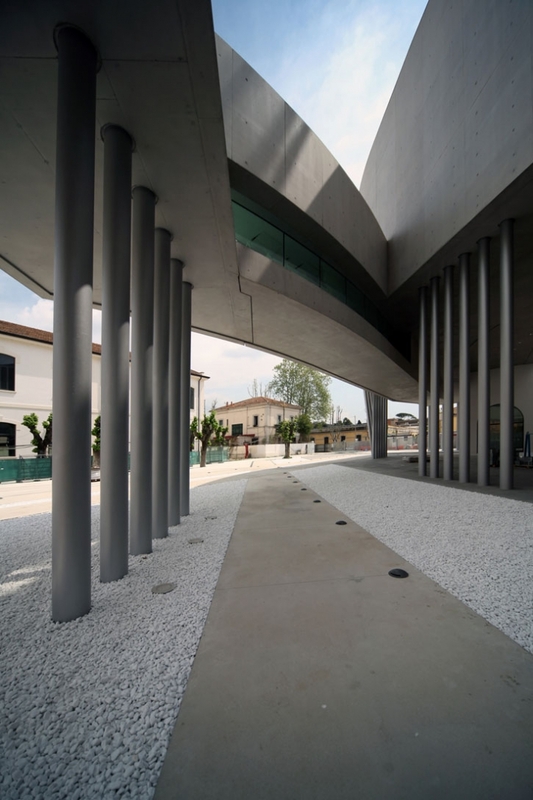 Zaha Hadid, the winner of the 1999 international design competition for this project is currently approaching completion in Rome’s Flaminio neighborhood, on the site of the former Montello Barracks. Since 2003 an experimental and innovative construction site has been working to complete this new, ultramodern and contemporary museum. 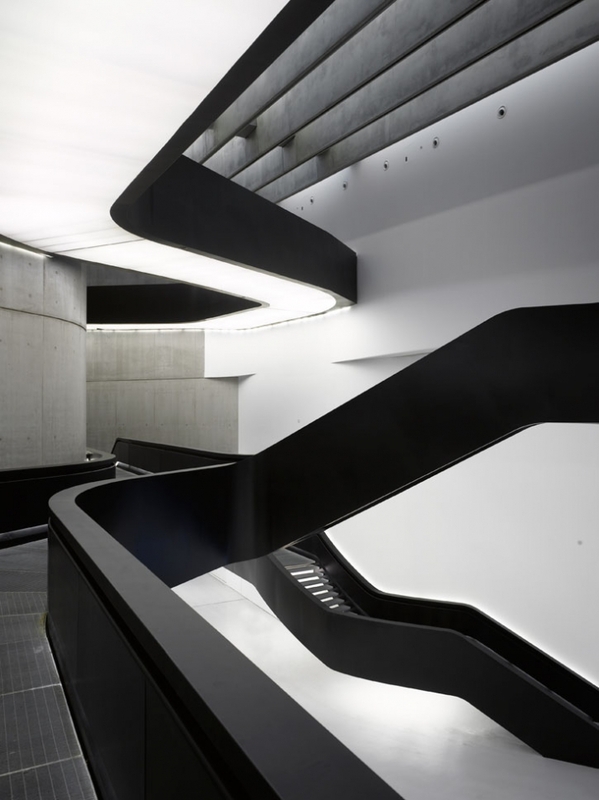 The museum runs over a surface area of 27,000 square meters, the complex was designed in such a way that it acts as home to two individual institutions: MAXXI Art and MAXXI Architecture. 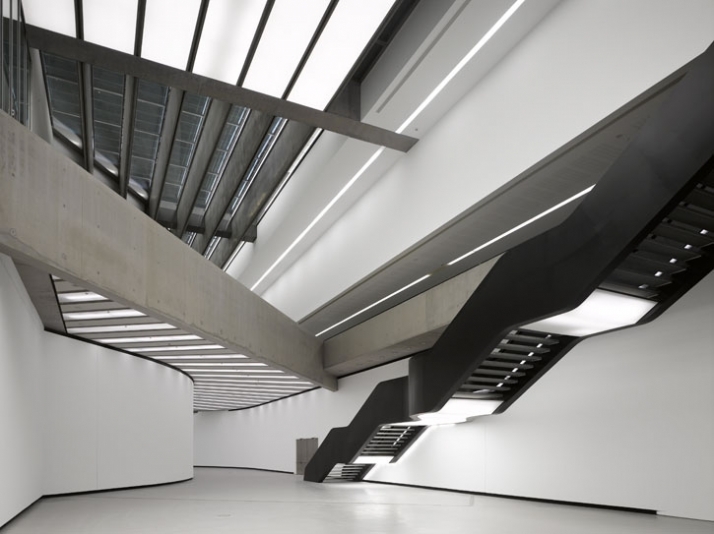 The MAXXI’s 27,000 square meters include in addition to the two museums, an auditorium, a library and media library, a bookshop, a cafeteria, temporary exhibition spaces, various open spaces for live events, commercial activities, workshops and spaces of study and recreation. 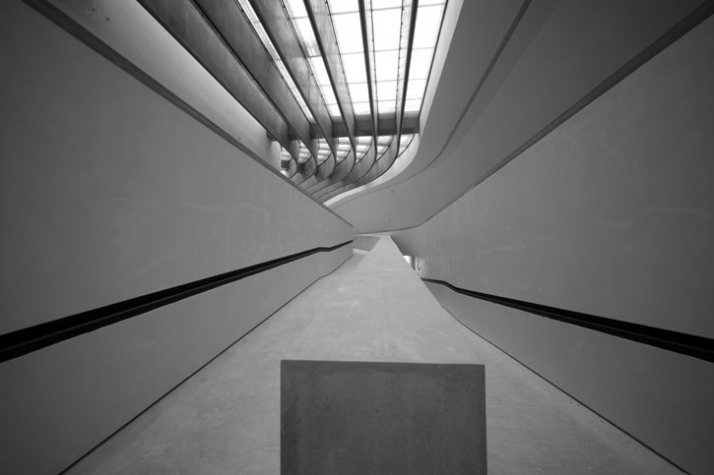 Zaha Hadid designed a museum where form follows function. The building is distinguished by two key architectural elements _ concrete and glass. The exposed concrete walls set the boundaries of the exhibition halls and establish the interweaving volumes, while the transparent glass roof modulate and filters natural light passing in. 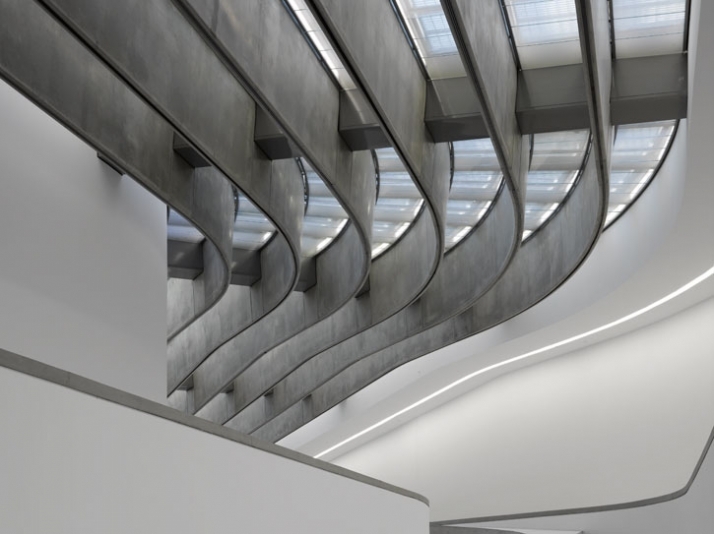 In this project the two museums - MAXXI Art and MAXXI Architecture – rotate around a large, double storey atrium, the point of connection with the permanent collection galleries and temporary exhibition spaces, the auditorium, reception area, cafeteria and bookshop. While the arrangement of the concrete walls, the glass roof and the steel stairs and columns characterizes the neutral appearance of the display areas, while portable panels ensure the plasticity of their use. The organic and flowing forms and the variation of the interweaving different levels in combination with the natural light flowing in create a highly complex spatial and functional experience that offers ever-changing unexpected views from the interior towards the open spaces. The projects interior finishes and furnishings are going to be completed within this year and the exhibition design and official inauguration of the museum will take place in the beginning of 2010. The form and the design which was given to this program has a flowing aspect which is actually very encouraging for the visitor as a museum is asked to function in this way. The form has a continuous flow and asks of the visitor to keep moving in the same pace that the building progresses. The architecture and the materials used enhance the natural light which is cleverly controlled through the interior architectural form. The natural light allows for the optimum natural lighting of the art works as well as the other pieces exhibited. The concrete walls create the perfect background setting to promote the arts, while the high ceilings with a maximum height of 22.90 meters make room for important pieces to be exhibited. Nonetheless, the intertwining structures are truly fascinating as all of Zaha Hadid’s works are. As an architect Hadid has managed to create the impossible – possible, and to amaze us with the unique forms which she and her architectural team design for projects worldwide. 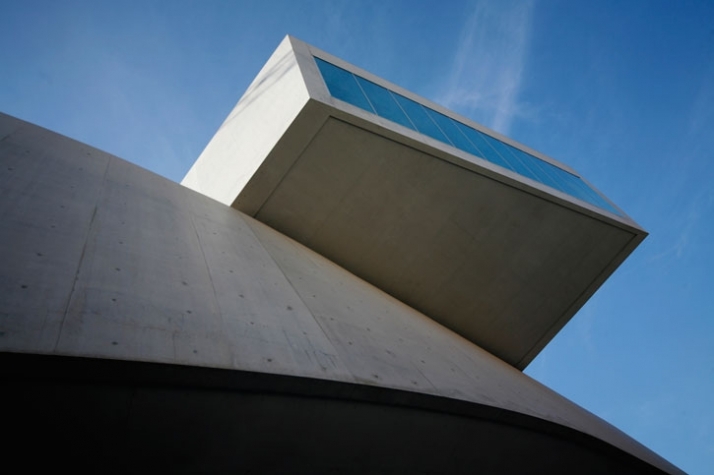 The MAXXI National Museum (via Guido Reni, 2f 00196 Rome/Italy) is focused on promoting the arts and architecture through the collection, conservation, study and dissemination of the most current movements. To date, the MAXXI Art collection contains over 300 works by such artists as Boetti, Clemente, Kapoor, Kentridge, Merz, Penone, Pintaldi, Richter, Warhol and others of equally prominent persons. The MAXXI Architecture collection features the personal archives of Carlo Scarpa, Aldo Rossi, Pierluigi Nervi and others, as well as projects by contemporary architects such as Toyo Ito, Italo Rota and Giancarlo De Carlo, together with the photographic collections of the Atlante italiano and Cantiere d’autore projects. 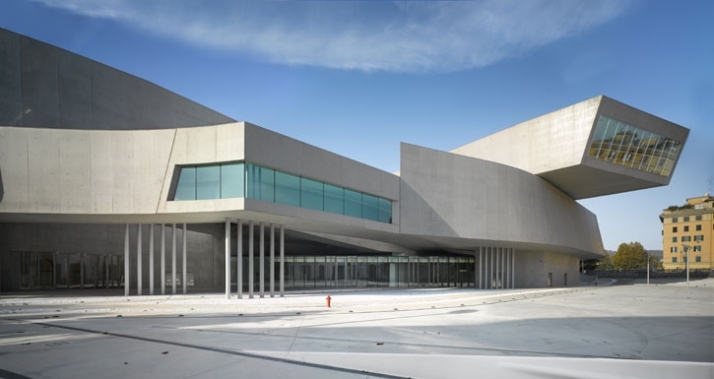 The official inauguration of the MAXXI National Museum is scheduled for 2010. Zaha Hadid is an architect who constantly challenges the known limits of architecture, urban planning and design. Through her research, Zaha Hadid pursues a continuous exploration focused on defining new spatial concepts. Fundamentally for Zaha Hadid it is the relationship between architecture and landscape that, when combined together, produces unexpected results and dynamic forms. At present Zaha Hadid is working on a significant number of projects, including: the Aquatic Center for the 2012 London Olympics; the Signature Towers in Dubai; the Performing Arts Center in Abu Dhabi; the Opera Theater in Guangzhou, China; private residences in the United States and Russia; and master plans in Spain, Istanbul and the Middle East.